A list of US presidents including dates served. 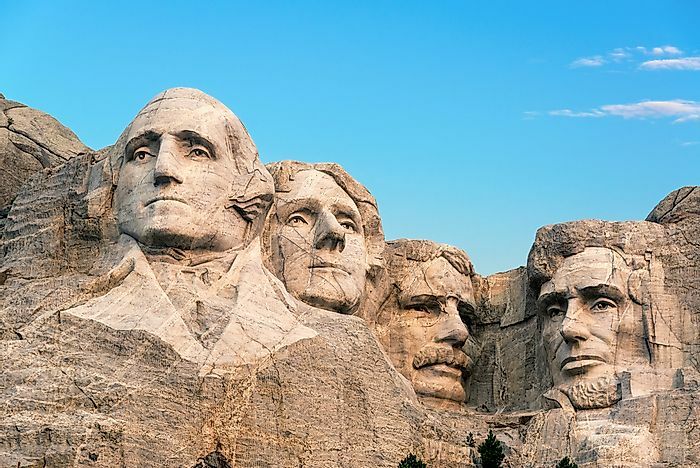 A view of Mount Rushmore, which features the busts of presidents Washington, Jefferson, Roosevelt, and Lincoln. The US president is widely considered to be among the most influential world leaders, if not the most powerful, primarily due to the economic and military strength of the US. The US was a British colony for approximately 170 years before attaining its independence on July 4, 1776. Since independence, the US has had 45 presidents, four of whom have been assassinated while still in office. Grover Cleveland is unique in that his two non-consecutive terms are counted as independent presidencies. The shortest serving president in US history was William Harrison who died after only a month in office due to pneumonia. Serving from 1789 to 1797, George Washington was the first American president. George Washington was one of the generals who led the US during the fight for its independence from the Britain. His experience in the military aided him in ruling the country. He is considered one of the greatest presidents in history due to the many precedents he set such as the two-term limit for every president. One of his most significant achievements was signing the Jay Treaty, which prevented war with the British. During his presidency, he faced a large number of challenges chief of which was the lack of unity in the nation. There was also a lot of infighting between two of his closest advisers, named Alexander Hamilton and Thomas Jefferson, whose ideas on the country's direction differed significantly. He died on December 14, 1799. Since the time of his death, multiple cities and monuments have been named for the country's first president, including Washington State and the capital of Washington, D.C.
One of the nation's most beloved presidents, Abraham Lincoln also holds the unfortunate distinction of being the first US president to be assassinated while in office. Lincoln was the president during the American Civil War, arguably one of the darkest periods in America's history. In 1860 he was elected president of the US which triggered the formation of the Confederate States of America, a union of seven states in the South of the US that supported the owning of slaves. Lincoln was a shrewd statesman, and through a sequence of complicated political maneuvering, he managed to bring an end to the war and win freedom for enslaved Americans. Lincoln was a great orator and in his most famous speech, the Gettysburg Address, he expressed his support for equal rights and nationalism, principles that he held close to his heart. John Wilkes Booth assassinated president Lincoln on April 15, 1865. Roosevelt holds the distinction of being the longest serving president in US history. He was a Democrat and was elected for an unprecedented four consecutive terms in office. During his presidency, he steered America through the Great Depression and the Second World War. Unfortunately, he died before the end of the war due to his failing health. The threat of Nazi Germany prompted him to run for a third term in office as he believed that America needed a strong leader to survive the danger. He was a strong supporter of environmental conservation, and during his presidency, more than two billion trees were planted by the Civilian Conservation Corps. The presidency is a symbol of national unity as the president is elected to serve all people regardless of whether or not they earned their vote. The president is also expected to provide stable leadership to guide the nation through a possible crisis. The president represents the country on the international stage and is expected to make agreements that are in the best interest of the country. This page was last updated on July 4, 2018.